Fiji is a beautiful island country in the South Pacific Ocean, encompassing around three hundred and thirty three tropical islands. The mainland, Viti Levu, is the largest landmass in Fiji, home to around seventy percent of the population. The best known islands are, however, the Yasawa and Mamanuca archipelagos, sprawled along the west to north coast, boasting the nation’s finest beaches and famous holiday resorts. 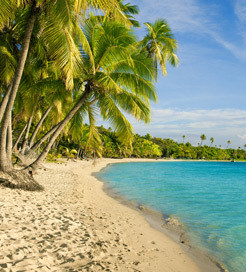 Usually, the mere thought of Fiji evokes feelings of tranquillity and happiness. This is owed to the warm, friendly locals and secluded stretches of sand with picture-postcard, crystal clear waters. Moreover, the surrounding Pacific Ocean can be regarded a world of its own, displaying a kaleidoscope of colourful coral reef and over fifteen hundred species of tropical fish. Known as the ‘soft coral capital of the world’, and a leader in ecotourism, Fiji’s waters provide day-long fun whether you’re a veteran diver or first-time snorkeler. There is plenty to keep you occupied on land, though. Thunderous rivers can be rafted, countless bird species wait to spotted and numerous hiking trails beg to be explored. You can also book guided 4x4 tours for the rugged terrain. The Fiji Museum in Suva, Viti Levu, takes you on a journey through the nation’s history and cultural development, featuring centuries-old clothing, traditional canoes and harrowing stories of British explorers coming face to face with cannibalism. When the scorching sun goes down, most hotels and resorts host vibrant beach parties, with high-end restaurants serving up freshly caught seafood, too. One of the best national parks can be found in the Colo-i-Suva forest, covering two and half squared-kilometres of lush rainforest with an abundance plant species and a symphony of bird song. After a long hike, you can reward yourself with a plunge into the numerous natural swimming holes, in true paradise style. What kind of ferries are available? There are plenty of ferry services connecting the Fijian archipelagos with the main island, Viti Levu. From the Mamanuca Islands, the Port of Denarau is around forty-five minutes to an hour’s crossing, while the equally frequent routes from the Yasawa group, which are further north, take a few hours. For more information, please visit our Ferries from Mamanuca Islands to Fiji page. For more information, please visit our Ferries from Matacawalevu Island to Fiji page. For more information, please visit our Ferries from Kuata Island to Fiji page. For more information, please visit our Ferries from Drawaqa Island to Fiji page. For more information, please visit our Ferries from Nacula Island to Fiji page. For more information, please visit our Ferries from Naviti Island to Fiji page. For more information, please visit our Ferries from Tavewa Island to Fiji page. For more information, please visit our Ferries from Nanuya Lailai Island to Fiji page. For more information, please visit our Ferries from Nanuya Balavu Island to Fiji page. For more information, please visit our Ferries from Wayalailai Island to Fiji page. For more information, please visit our Ferries from Yaqeta Island to Fiji page. For more information, please visit our Ferries from Waya Island to Fiji page. For more information, please visit our Ferries from Naukacuvu Island to Fiji page.